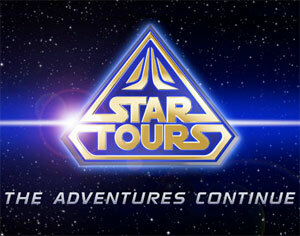 On June 3, 2011, Star Tours – The Adventures Continue will open at Disneyland Resort in California. The 3-D adventure has already opened at Walt Disney World Resort in Florida. The new, updated attraction uses digital video leveraging Dolby 3-D to deliver a vivid and realistic visual experience. It incorporates a dramatic musical score and motion simulator-based technology so guests are immersed in a Star Wars adventure like never before on a theme park attraction. Walt Disney Imagineering worked with Lucasfilm, Ltd. and Industrial Light & Magic to bring the “out-of-this-world” attraction to life. Star Tours, which had thrilled Disney guests since the 1980s, was “powered down” in 2010 so Disney’s Imagineers could begin work on the new attraction. In “Star Tours – The Adventures Continue,” there are more than 50 story combinations, so guests can find new adventures each time they experience the attraction. Using the random story combinations, the Starspeeder spacecraft embarks on a wild adventure, visiting several planets made famous in the Star Wars films. Among the locations that might provide haven from the Empire’s pursuit are the icy planet of Hoth, the lush jungles of Kashyyyk and the underwater Gungan world on Naboo. And along the way guests may encounter Star Wars characters that offer to help (or hinder) their journey, including Yoda, Admiral Ackbar, Darth Vader and Boba Fett. “Skytroopers,” a legion of stormtroopers created just for the Star Tours attraction story, might even join in the chase. For more information, visit disneyworld.disney.go.com. Looking for a haunting good time?